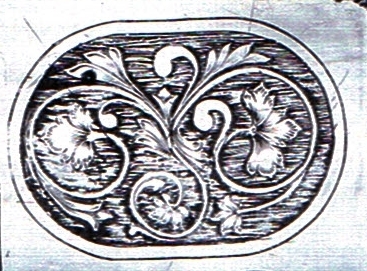 My research turned up a few guns engraved in a Celtic style in Douglas Tate’s book ‘British Gun Engraving’, but these are mostly strapwork, which I judged to require more precision than I can muster if they are not to look a mess. 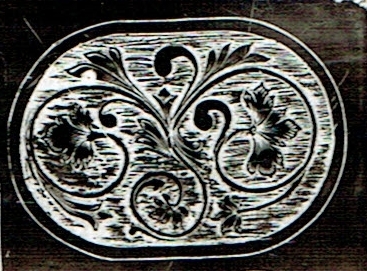 In the end I decide to use a ‘rope’ border and a thistle motive – there was one gun in Tate, engraved by John Salt, that had a stylised thistle which I used as a basis. Google images as usual provides a few general thistle images that helped. I haven’t found any Celtic styled guns from pre-breechloader days apart from Scottish pistols of the Doune type, so its not really ‘traditional’. I decided that I was being a bit of a coward not engraving strapwork so I had a go at a simple design – here is the pull and the same with the colour inverted as it would appear on a gun – the original is about 60 mm long. To be proper Celtic engraving the straps should have angular corners rather than be evenly curved – and the wavy strap needs more detail to bring it to life. The hatching of the background is a bit uneven too – it was all done in a bit of a rush! Doing the border broke the points off innumerable gravers – I must get better at cutting out small backgrounds. I have a pile to grind down and it takes ages on my 1200 grit diamond lap – I must get a coarser one for reshaping tools – up date I now have a 260 grit hone on order but its out of stock – maybe the broken points can wait. And another little engraving – classic strawberry leaf – it looks better in reality because the contrast between the background and the raised bits is higher than in the smoked images.